Ohaneze Ndigbo condemns President Buhari’s refusal to appoint an Igbo indigene as Secretary to the Government of the Federation – Royal Times of Nigeria. President Buhari on Monday approved the appointment of Boss Mustapha, as the new Secretary General of the Federation. Mustapha’s appointment comes after the former SGF, Babachir Lawal, was sacked following his indictment in the misappropriation of funds meant for the welfare of IDPs. 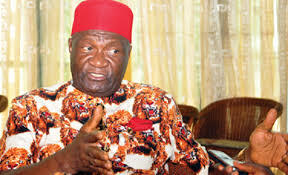 In a statement released yesterday, President of Ohaneze Ndigbo, John Nwodo, said the appointment of Mustapha as the new SGF and not an Igbo person, has further given credence to the obvious marginalization of the Igbos in the Buhari-led administration. According to Chief Nwodo, appointing an Igbo man as SGF would have helped to heal wounds and reconcile a disgruntled people who believe that this government has overtime ignored the Igbos. He wondered how President Buhari cannot find somebody from the South East he can trust for the SGF position. The Ohanaeze president urged the President to open his mind and have a positive attitude about Ndigbo whose contributions to the socio economic and political development of the country is not in doubt.